For more information, write to contact@canopycanopycanopy.com. 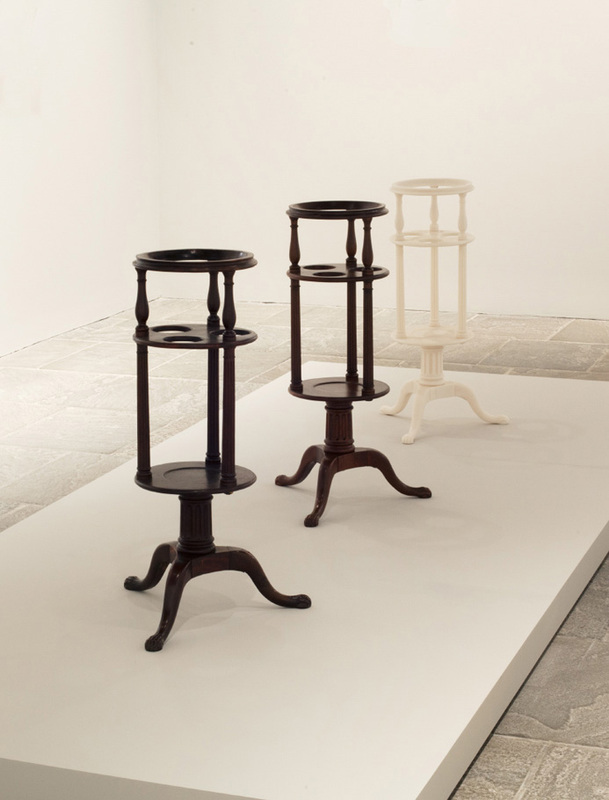 Pointing Machines (Basin Stands) was produced as part of Pointing Machines, Triple Canopy's contribution to the 2014 Whitney Biennial. Pointing Machines is named after the simple eighteenth-century measuring tool for reproducing sculpture in stone or wood by means of a system of adjustable rods and needles. This pair of replicas is based on an antique basin stand (front) now in the collection of the Metropolitan Museum of Art and once owned by Colonel Edgar William and Bernice Chrysler Garbisch. The handcraft mahogany replica (middle) was fabricated by Frank B. Rhodes, a furniture maker and the grandson of the Garbisches. The polymer plastic replica (rear) was fabricated by the New York University Advanced Media Studio, using a 3-D printer. In Pointing Machines, Triple Canopy asks how the meaning of artworks shifts as they are commissioned, made, collected, disowned, replicated, photographed, exhibited, and published, taking into account the role of circulation systems as varied as the Metropolitan Museum of Art and eBay. Pointing Machines (Basin Stands) is included in Triple Canopy's installation at the Whitney. The installation is part of an issue of the magazine, also titled Pointing Machines, that continues the reproduction and circulation of the displayed objects beyond the museum’s walls, and includes essays, artist projects, discussions, and performances to be published and presented throughout 2014.